On the five-year anniversary of being crowned my high school’s homecoming queen, I lost my shoe running onto the subway. When I made a dramatic leap through the closing train doors, my black ballet flat (or should I say my slipper) slid off and was left halfway between the yellow “don’t-cross-me-or-you’ll-lose-a-limb” warning line and the concrete beyond. Something that belonged to me was stuck in the space between safety and jeopardy. The train pressed forward. I turned around and saw subway passengers stare at my shoeless foot, which hovered above the sticky floor. I shrugged at no one in particular, in a these-things-happen-oh-isn’t-life-so-funny way, and stood in a flamingo stance with my black-stockinged foot tucked underneath me while I decided what to do. It only took two seconds. I wasn’t going to walk around with only one shoe. When we lose things, we go back to find them. I lost a lot of things in high school. Instead of getting left behind in a space between safety and danger, most were left in an entirely different place altogether, the place of seemingly no return. I lost homework and permission slips. I lost friends. I lost interest in everything I used to love. I lost myself. I did not go back to find any of these things. My identity crisis was deeper than hormones and teenage angst (though I had plenty of both). I was, and still am, clinically depressed. Finding out I had depression was a surprise. In my high school health class, we defined depression as being unable to get out of bed in the morning (or the afternoon or the evening). This is true for many people, but also an extreme. In reality, depression can also be the soreness you feel in the morning after sleeping funny. Your neck and shoulders hurt, yes, but it’s mostly a soreness of the heart. You can still get out of bed with a sore heart, at least for a while. The ache within me only grew as I progressed through high school. I don’t know if the decision to run for homecoming queen my senior year was another part of losing myself or of trying to find it again. I still can’t understand what part of me thought running was a good idea. I was not a cheerleader, like the homecoming queen before me. (I know life is not a teen movie, but being a cheerleader seems to be an unofficial criterion for being crowned teen royalty at a public high school.) Instead, I danced in show choir, stood in the background of school musicals with other chorus members, and — despite my teachers’ urgings to “please contribute to peer discussion” — did not talk, or otherwise look up from my notebook doodles, in class. I did not think of myself as anything more than a person trying to survive from one day to the next, much less queen of the school. 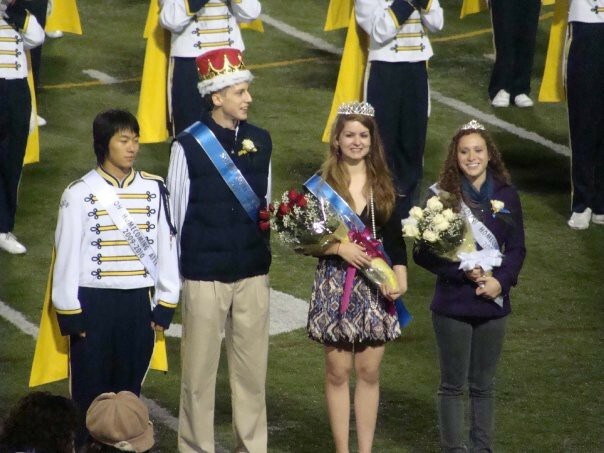 But I’d been fascinated by homecoming queens since fourth grade, when I saw a teenager crowned during a football game. A teacher placed a sparkly silver tiara on her head, and the girl’s parents gave her a huge hug and cried. Then her friends surrounded her in an even bigger hug and they cried, too. Everyone cried happy tears for the teen queen and she waved to the adoring people who sat on the bleachers in our suburban Ohio town. When I was nine, I wanted to become homecoming queen so I could have a crown. When I was 17, I wanted to become homecoming queen so I could give my parents a reason to cry happy tears, instead of the ones they cried because they couldn’t find a way to help me. My parents couldn’t care less if I won homecoming queen. They had much bigger concerns about me, none of which involved whether I would wear a crown to my last high school homecoming dance. I’m sure they weren’t crazy about me running. And in hindsight, it wasn’t the best idea for a self-conscious, depressed teenager to take part in a school-wide popularity contest. 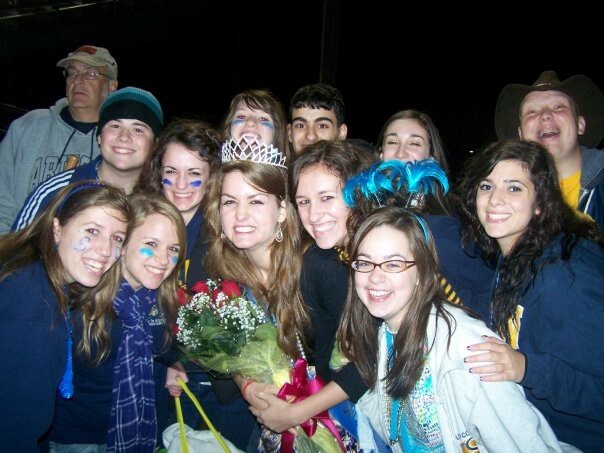 But at the time, my 17-year-old brain was convinced that winning homecoming queen would be a way for me to bring happiness to myself and to the people I loved. Today, this doesn’t make any sense. Then again, neither does anything about depression. 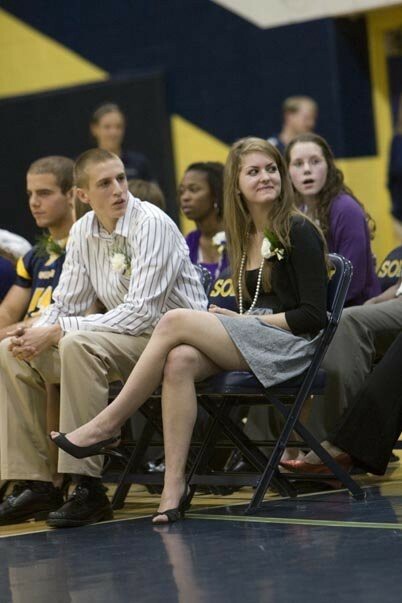 I thought being homecoming queen would help me achieve the elusive goal of feeling happiness, no matter how fleeting, but I was deeply mortified at the thought of being recognized in front of the entire school. Even worse, my high school made candidates nominate themselves for royalty positions. You couldn’t have a trusted friend do it. Instead, you had to walk across the entire cafeteria, past the tables of cliques, to the front, where everyone could see you. Once you stood at the wood table, you had to utter the words “I would like to run for homecoming queen,” as if you would be doing anything else at the table labeled “sign up for homecoming royalty here.” Then, and only then, could you write your name on a piece of notebook paper, where everyone could see that you thought you were cool enough to be deemed queen of the school. On the last day to self-nominate, my feet followed a maze of condiment-stained tiles to the front of the cafeteria. I mumbled to the table, not the people sitting at it, that I would like to run for homecoming queen, and signed my name on the sheet in nearly illegible cursive because my hand shook so intensely. I followed the maze back to my seat, sat down and stood right back up again, ready to cross my name out, realizing what a horrible mistake I had made. But because I had waited until the last possible second, the bell rang and I had only a few minutes to run to my locker and to class. My name stayed at the bottom of the list. Later, my name transformed from a crunched cursive word to a neatly typed line on a ballot. This was passed out to the senior class, who would vote to narrow the field down to five candidates. We voted in English class, which I had at the end of the day. The whole day, I tried to smile in the hallways and look up from my notebook doodles so my classmates would think they were voting for a real person instead of a sad robot. I made the top five. I was both excited and horrified. The entire school, not just the senior class, votes for the homecoming queen, which meant I would have to find a way to campaign to all 2,000 students. I would need to make myself known to all of them. My more outgoing theatre friends made their buddies in the drama club, show choir, and band promise to vote for me, thus securing the “artsy kid” vote. My mom made hundreds of buttons, which said, “Don’t be a Schmo, Vote for Po.” Po, a shortened version of my last name, was a nickname a few friends and acquaintances in show choir called me to distinguish me from the many “Allisons” and “Allies” in my school. No teachers, and almost no students besides maybe ten people, referred to me as “Po,” so I’m not sure why we used a nickname on the buttons, or why we made buttons thinking that high schoolers would actually wear them. My mom made my brother, who is two years younger, pass out the red-white-and-blue buttons to his less-than-thrilled sophomore friends. On voting day, I took the bag of buttons down the freshman hallway before school started and slung it over my shoulder like Santa. I walked up to a 14-year-old stranger who was drinking chocolate milk through a straw, because he was alone and seemed approachable. I asked if he would maybe please consider voting for me for homecoming queen. If he did, he could have a button. If he didn’t, he could also have a button. He didn’t take one. I felt a warm blush spread from my chest onto my cheeks. I walked out of the freshman hallway to my locker, where I stuffed the button bag inside. I would later tell my mom, who was wearing a button when I came home from school, that I gave them all away. When it came time to vote, I stared at my name on the ballot. The night before, my parents warned me that people would ask if I voted for myself. I should not only say yes, I should actually vote for myself. If you don’t believe in yourself enough to vote for you, why should anyone else? They said. Everyone in my class turned their ballots in, but I continued to stare at mine. I finally put my pen on the paper and drew a small checkmark next to my name. I turned my ballot in and sat down. “Who’d you vote for,” the boy who sat next to me immediately asked. My depression makes me feel like a moon that comes out when the sun is still trying to shine. I foreshadow darkness everywhere I go. The day of the homecoming game, I walked into a crowded gym full of my peers, who were happy because they got out of class early for a pep rally. I was not happy; I was shaking in terror. I was scared that, just by stepping into the gym, I would eclipse the mood. No one seemed to notice how terrified I was, of course, because that’s how high school (and life) is. You believe that people will notice the zit on your face, the new highlights in your hair, or your broken heart, but everyone is so consumed with their own acne and appearance and emotions that they don’t. I was the same. I couldn’t tell you anything about how the other candidates felt when we sat in chairs on the gym floor during the pep rally. I only remember wishing my folding chair would melt into the ground and take me with it. I would be dissolved into a puddle, but at least someone would be able to clean up the mess. Instead, I stayed a human with a hidden mess that few people knew I had, and nobody knew how to fix. The hours between the pep rally and the football game were filled with dread. Finally, during halftime of the football game, I walked onto the football field, escorted by one parent on each arm. I don’t remember hearing my name called. I do remember a flash of pictures, a crown placed on my head, and being quickly shooed off the field so the game could continue. I remember both of my parents crying happy tears. I remember my friends crying happy tears. I remember people cheering from the bleachers. I remember, for the first time in months, finally feeling all cried out. If this were a teen movie, that would be the end. But it’s not. Sorry. Being homecoming queen did not solve everything (surprise, surprise). The sparkly fake diamonds on the tiara did not have the power to zap away sadness. The sash did not function as a shield that could protect against a broken heart. 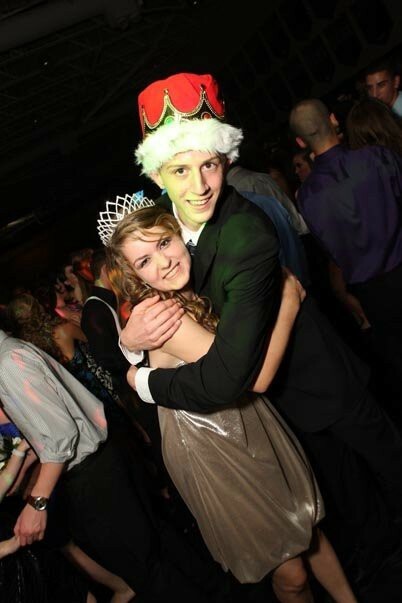 Being “teen royalty” lasted for about 24 hours, and even then, it only mattered for a few pictures and one awkward slow dance with the homecoming king, whom I didn’t know. That year, the yearbook staff forgot to make a page for the homecoming royalty, so it isn’t even documented in the class archives. It is part of my history, though, as strange as that still seems. I do not think about being homecoming queen often. If I could, I would break my crown into millions of pieces, Mean-Girls style, and give it to everyone who suffers from mental illness. But I know that those of us with mental illnesses aren’t searching for crowns or titles. We are searching for a sign that people in our lives care. In hindsight, I can see how much people cared. Now, I know that my mom made buttons not because she wanted me to win, but because the buttons allowed her to wear her love for me outside of her heart. I know that my friends did behind-the-scenes campaigning to get people to vote for me. They spoke up for me when I couldn’t speak up for myself. I try to remember this now, on the days when I find myself back in the folding chair wishing I would melt away. After I lost my shoe, I got off at the next subway stop. I hopped down the stairs on one foot, pogo-ing on one leg and trying not to let my shoeless foot touch the ground. I hopped onto the subway going the opposite direction, went down the stairs and then jumped all the way back up. My shoe was in the exact same position, at a slight angle, waiting to be stepped into. When I slid my foot back in, one man clapped, “Just like Cinderella!” he said. No. Not just like Cinderella. I am not a princess, or even a queen. I am a person, who has lost things and is going back to find them. I am still picking up the pieces I left behind. Stories about who we are, together and alone.